My Christmas Tree twinkle with rainbow colors, my deck´s varanda is illuminated with festive lights and I can hear late night BBQs taking place all around the neighborhood. It was only 2009 a few seconds ago…I was sitting by the couch, looking at the sea, eating pancakes with strawberries, orange juice and the feeling of a well lived year. My 8-year-old was opening his presents while jumping around and some mexican carols with a touch of salsa were playing in the background. Is almost Christmas morning again. This time I have the view of native New Zealand bush with the river moving silently by its feet. I have had an interesting year: I moved house, changed jobs and gave birth to a beautiful girl. All these in 362 days or the blink of an eye. Two Thousand and Eleven comes with many promises and many wishes which I will write about on the awakening of the New Year. For now I will concentrate on the feeling of a silent night and the many musings it is bringing…. 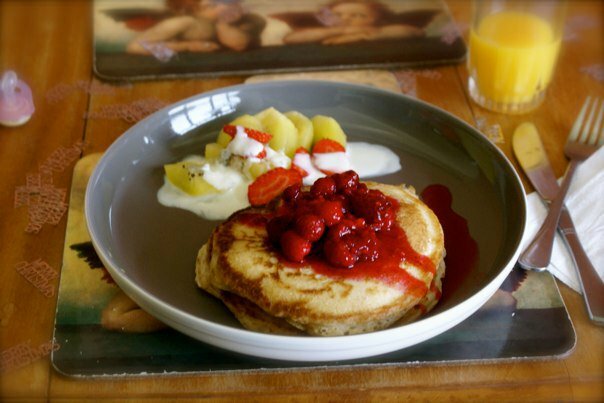 This entry was posted in FOOD, Recipes and tagged Christmas, Feliz Navidad, Holidays, new zealand, Pancake by onlifemag. Bookmark the permalink.